MEOW! Before I start my post, I just wanna say thanks to all Meow Diaries fans out there! And just to recap what this blog is about, this third blog of mine is all about Freelance copywriter Mariuca working from home and my three adorable fluffy cats. So if you see me writing about other stuff aside from my cats, that just means it's Master's time to post about whatever takes my fancy then okay? Today, I want to share my Adgitize earnings with you at Meow Diaries since I'm advertising my cat blog on the Adgi network this month. 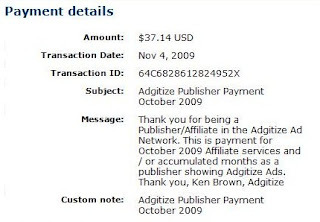 As you already know by now, I am a huge Adgi fan and ever since I joined late last year, Adgi has done nothing but bring traffic my way and I also enjoy a neat tidy sum at the end of every month, for all my hard work with Adgi. If you want to read more on how Adgi works and Adgi Pays you can read my two other posts here and here. The thing with Adgi is that you can't simply have your widget up and do nothing about it, then expect and hope for great results at the end of the month. Just like any other advertising programs out there, effort is KEY! So if you wanna start reaping the benefits of Adgitizing your blog, start WORKING for it! For me, this is what I do to make myself seen and heard on Adgitize. Don't forget to promote your membership at Adgitize too and by promoting, I do not mean SPAMMING at other people's blogs. Be creative in the way you promote your membership and soon, you too will be on your way to earning BIG BUCKS with Adgitize. Not to mention the TRAFFIC you will receive as well. So here are my earnings for October and if you fancy riding the money and traffic train with Adgi, start Adgitizing your blog! Have fun with me on the coolest blog advertising program today! hahahahhaahh yeah don cry non-stop fc2!!!! LOL!! U monitor la this next round of payment…see if u make more here or at NN… I only got one payment from NN after almost 3 years with them…for RM50..then quiet as a furry mouse and now stagnant… even before I joined Adgi so not to say it’s cause I joined Adgi that NN is not moving right? ok i'll monitor! if NN pays more then i'll remove Adgi lah! oh dat's her iconic chop smiley?! LOL! ok sure! i'll let u know! Yeah!! That is GG’s iconic chop smiley, how adorable hahahaha, forever crying and chopping! Wakey wakey GG!! LOL! Meow 2 taken edi, GG too late hehehehe! Hahahah yeah Grandy is Meow 2!!! GG busy playing hahahaha! LOL GG crying inside her dorm is it? Hahaha, hugs GG!!! LOL!!! Here comes GG and her iconic smiley!! GG waited for u just now but no GG oso hahahhaha…..
S’okay GG u still Top Chopper so far…11 points edi!! hugs! wahhh GG >:o >:o >:o >:o >:o non-stop!! Oh no GG can’t stop crying tonight aiyooooo hugs hugs hugs! Me LOL here GG!! Dat’s why la meows flooded with GG’s tears hahha!!! LOL @ enuff lor hahhaha Mon so funny tonight LOL!!!! And GG said wan to zzzzz but still crying here! LOL!! ohhhh u didn check comment box! LOL!! 11 points edi GG, so many chops! Mon oso 8 points only here hahahah, hugs GG!! Some more Grandy first time chopped here GG hahahah! no lah u gave which email Mariuca? I gave ur gmail add! ohh Selamat Hari raya Haji to u and B!!! Thanks sweetie, happy to enjoy our 3-day weekend… wanna relax! But 600 more to go… dropping for MPG next! B cuti tomo woo hoo sure wan to bangun lambat! yay happy for u guys can relax together-gether!! yes can relaxi taxi together- gether tomo!!!! woot! Mariuca is gonna cook something special!!!! LOL maybe Ill go through my dusty cookbooks later LOL! hahahah ok i'm sure u can do it Mariuca!! Thanks sweetie… will take pics of whatever I make, if jadi la! YUM! wang besar wang besar.. lol!! congrats dearie.. banyak tu!! woott.. looks like that tarot card reading is coming true!! yippee!! Recent blog:=- Happy Thanksgiving from Cute! grats on the earning :). wow, congrats! good for you dear! And it's a very tempting $$! I couldn't resist it, just renewed my ad today. congrats on the payout. i'm happy for you. just fine GP! gotta :* :* :* :* now!haha! Ur not convinced GG? Let me convince you NOW then hahaha!